Eel Pie Island, in the River Thames, is located in Twickenham, of Rugby fame, about 16 kilometres from central London. During the early sixties, the Eel Pie Hotel gravitated from being a jazz club to a nascent centre for British rhythm and blues. The Rolling Stones, Rod Stewart, Eric Clapton and Long John Baldry all performed there. Howlin' Wolf sang "That's evil, evil is goin' on wrong." I saw Howlin' Wolf perform on Eel Pie Island; I recall he brushed past me on his way to the bar. This was not my first visit to Eel Pie Island - that would have been for a St. Mary's Teacher's College dance. Traditional jazz, played in a dimly lit dance hall, where the floorboards beamed when you walked across them and zodiac signs adorned the stage's wall. 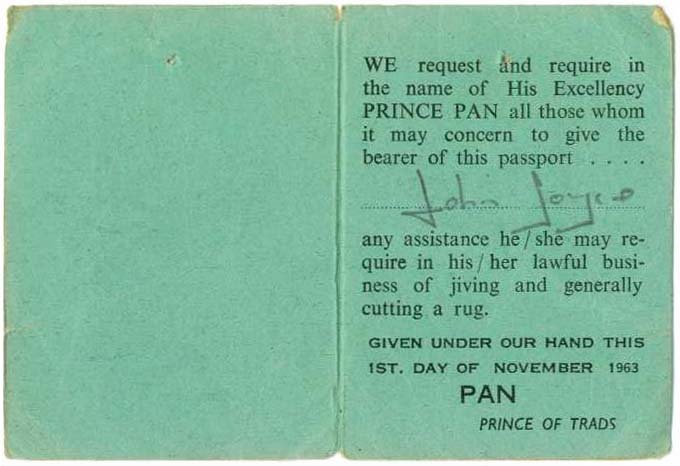 This was probably in 1962; I remember very little else. A few years later I worked at the door, checking tickets for one of the Chiswick Polytechnic's school dances. Twickenham's large outdoor pool, where I sometimes swam, was adjacent to Eel Pie Island. I have always wondered why it was destroyed. There was a toll to cross over a footbridge to the island - few pence, I recall - collected by some river person, who probably lived on a houseboat. 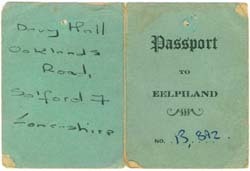 One Wednesday in August 1963, I skipped training at the Teddington Physical Culture Club and went to hear the Stones. I had heard their Chuck Berry song "Come On" on 208, Radio Luxembourg. There were still no huge queues or a need for membership, but that changed over the subsequent weeks. 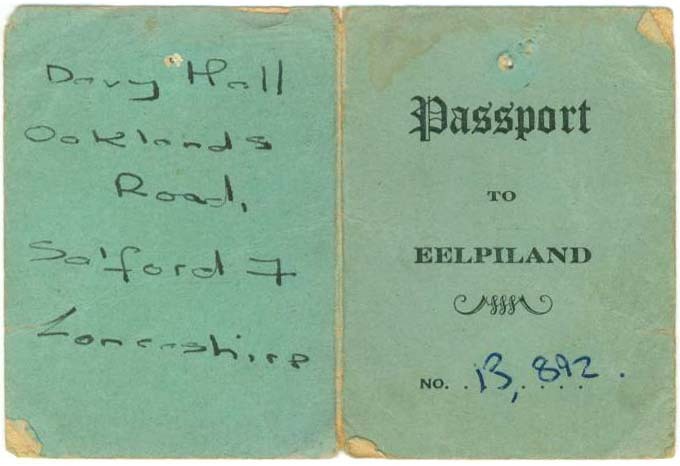 I still have my membership card: Passport to Eelpiland, No. 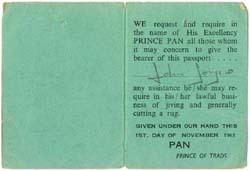 13892, Pan - Prince of Trads. One Wednesday I walked over the footbridge with Ian Stewart, who in the previous weeks had been the Rolling Stones' pianist; Andrew Loog Oldham must have done his dirtywork that week. "Stu," as he was affectionately called by the Stones, recorded with them for many years and became their road manager. I remember he didn't have to pay for entrance and I did. On a couple of Wednesdays the crowd stamped and shouted for the Stones to perform the Beatles' hit record "Twist and Shout." They never did, but they retorted with a Bo Diddley song or "Route 66," I can't recall which. At one of these Wednesday sessions, I remember Eric Easton, co-manager of the Rolling Stones, standing and announcing that the Stones were going to appear on a new television program called Ready Steady Go. I once heard Cream play, accompanied by lots of blues harp; it was allegedly their first performance. Slowhand had recently left John Mayall's Blues Breakers for the second time. There was also a lot of harp, electric harp, when Cyril Davis performed. I believe I heard Ottilie Patterson sing one Saturday night, probably with Chris Barber. I heard Long John Baldry sing a few times. Was he then with Bluesology? Did he sing "Hoochie Coochie Man"? Saturday night became the traditional jazz night and Sunday was low-key music night. I recall some summer Sunday evenings sitting outside the dance hall, drinking draft cider and gazing at the River Thames. Were we all underage drinkers? For some reason, I see Long John Baldry walking beside the Eel Pie Hotel. The conversations would have not have been about music but about groups: The Graham Bond Organisation, the Others, Jimmy Powell & The Five Dimensions, Manfred Mann, John Mayall's Blues Breakers. Who was joining and who was leaving and where were they performing? We certainly didn't discuss string theory or "our place in Europe." I am writing from Vancouver, Canada, where I have lived for some years. Most folk I associate with prefer to talk sport. Twickenham equals rugby, and I am often asked, where exactly is Wimbledon? I have closeted memories of those Eel Pie Island days and am amazed how the personalities of that era have travelled with me. I once had a pleasant conversation with the late Long John Baldry. I understand Andrew Loog Oldham lives somewhere in Vancouver. Chris Barber gave a great concert here and I had a chat with him in the auditorium. I take lunch near a record shop which has a poster of one of the former vocalists with Jimmy Powell & The Five Dimensions; it advertises the Great American Songbook Volume IV. I see he received an MBE. The Roosters' old guitarist will be playing in Vancouver soon, and the Birds' former bass player had another art exhibition here. The Rolling Stones played here the other week - without Brian Jones, of course. On Christmas Day my wife gave me Elton John's Christmas Party CD (I also have Oscar Peterson and Oliver Jones on my desk). I checked, and yes, Reg Dwight had been the keyboards player in the band Bluesology, which included Long John Baldry. Howlin' Wolf got it wrong, but it was evil to destroy the Twickenham swimming pool.